On sunny summer weekdays, I often wonder: Is it too late to break into the food truck business? The intersection of Second Avenue and Sixth Street right outside our office is a popular gastro parking hub. This time of year, the sidewalk gets so congested with lunchtime customers it can be difficult to pass by. Crowd aversion led me just a couple of blocks east, where the food truck lines are short and the seating is plentiful. I’m talking about the Commons—easily Minneapolis’s most underappreciated urban park. 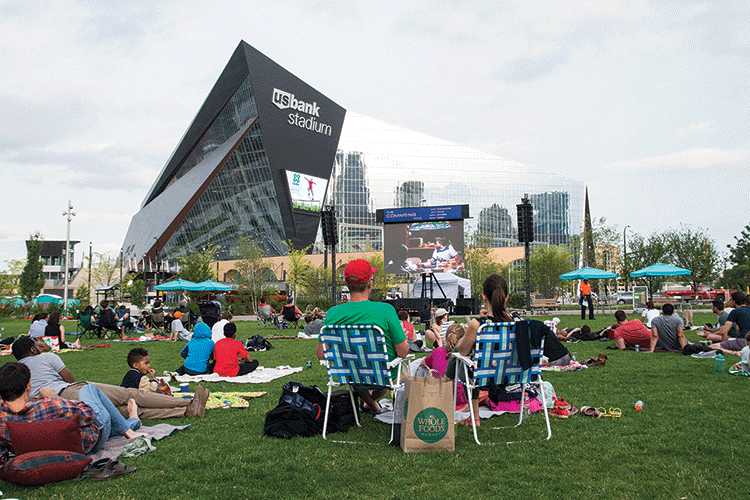 Unless you work at the Wells Fargo Downtown East towers or live in Edition apartments, which overlook the 4.2-acre park, chances are the only time you’ve visited the Commons is to cut through en route to a Vikings game at U.S. Bank Stadium. The park tends to get described as the Vikings’ “front yard.” Whether or not you agree with the city’s decision to pay $20 million for the land and let the Vikings use it for free on game days, that amounts to fewer than a dozen days per year. Seems like it would be an easy goodwill gesture for the $2.4 billion Vikings to help pay for park maintenance, the 24-hour security, and additional amenities. The Minneapolis Park and Recreation Board (reluctantly) agreed last year to kick in $8 million to complete the park. But wherever you come down on that debate, and the ongoing legal battle over who runs the park, it’s here. It’s open. We should use it. “We’re still trying to say, ‘We’re here, and this is a city asset.’” —Beth Shogren of Green Minneapolis, which runs the Commons. This year, the Commons will host more than 100 free public events, from chess tournaments to movie nights. It’s easy to equate the quiet fields with unfulfilled promises. But there are things to do: free Ping-Pong and game carts packed with bocce and footballs; a pop-up library with books to share, art installations, and free Wi-Fi. Perhaps most appealing: shaded tables to enjoy lunch. At least eight food trucks park at the Commons on weekdays. The lines are much shorter than on Second Avenue. So why isn’t the park inundated daily with office workers from the many nearby buildings? It’s tough to get people to break with routine. The challenge is even trickier because of the negative press surrounding the Commons. The park is owned by the Minneapolis Park and Recreation Board, leased to the city of Minneapolis, and operated by a nonprofit called Green Minneapolis. A former City Council member filed suit saying that arrangement was illegal, and in May, Hennepin County District Judge Bruce Peterson ruled that the City of Minneapolis doesn’t have the authority to operate the park. But none of the involved parties know where that leaves them, and so they await Peterson’s decision, which could take months. Meanwhile, Green Minneapolis executive director Beth Shogren and her staff of one work to shift the focus from legal standoff to the Tuesday evening farmers’ market. “We’re still trying to say, ‘We’re here, and this is a city asset,’” Shogren says. Her efforts this summer will culminate with the Sept. 25 return of the Minnesota Orchestra for its second annual concert at the Commons. Last year’s free event drew 3,500. Put it on your calendar. And before then, make a point to take a free yoga class in the park. Meet friends or colleagues for lunch. There’s no arguing that green space is vital to the city, and a park with the capacity to host big cultural events is a plus. We’re rich with attractions here in the Twin Cities—including vineyards. This month’s cover story takes us to another alluring green space in the midst of a legal standoff. There’s an industry at stake that is more significant to the local economy than you might realize. Minnesota is full of surprises.